Lillian Frost goes to Los Angeles in 1937 for the same reason that so many others did -- to become a movie star. She's smart, she's attractive, she's witty, so how can she miss? By being a terrible actress, that's how. Her screen test proves to everyone, including her, that her future's not in the movies, and she finds herself working in a department store. And then her former roommate, Ruby, is murdered. That changes things, and soon Lillian is amateur sleuthing up a storm as sort of the Archie to Edith Head's Nero Wolfe. Ruby, it seems, has been "borrowing" clothes from Paramount's wardrobe department, which is where Head works. She's not yet well known at all, but she's smart, and she's interested in the case. There's also a handsome police detective who's working on the case and who's not entirely averse to have Lillian and Edith help him out. Author Patrick (the writing duo of Rosemarie and Vince Kennan) gives a good many Hollywood stars cameo roles, my favorite being Barbara Stanwyck. We get plenty of glitz and glamour, snappy patter, clothes talk, and in-jokes. I'm sure I missed a few of the jokes, but the ones I got made me grin. And speaking of in-jokes, I might be the only person who reads this book, including the authors, who knows the true significance of the reference to Don the Beachcomber. You see, Don the Beachcomber was from my hometown of Mexia, Texas. So was Les Baxter, but he's not mentioned. Neither is Cindy Walker one of the greatest songwriters in country music history. I'll bet "You Don't Know Me" has sold more records for more artists than just about any country song. Mexia had more famous folks than just Anna Nicole Smith. But I digress. Design for Dying is a delightful book and would be even if it hadn't mentioned Don the Beachcomber. 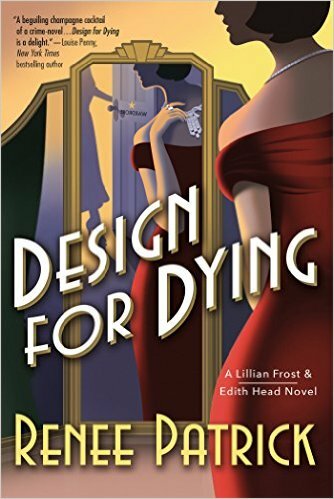 Lillian Frost is a wonderful first-person narrator, and Edith Head is an excellent semi-armchair detective. 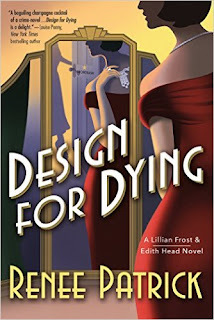 I predict big things for this series, and I'm looking forward the Lillian Frost's second adventure, even though this one won't be published until April. Be on the lookout for it. It's one not to miss. Going to put it on I-L-L as soon as it's published. And They Can Cause a Melee! First It Was the Thin Mint Melee . . .
New Sax Rohmer from Stark House Press! Dallas Taylor, R. I. P.
Noreen Corcoran, R. I. P.
Dale Griffin, R. I. P.
Glenn Frey, R. I. P.
Gary Loizzo, R. I. P.
Peggy Anderson, R. I. P.
It's Martin Luther King Day! Ted Marchibroda, R. I. P.